CHENNAI: Representatives from vulnerable sections of the population that include persons with disabilities, women and transgender people, believe they have received a raw deal with the two Dravidian majors releasing their manifestos on Tuesday. “We are happy that the DMK took note of our needs but they could have done more instead of promising easy access to polling booths which is, in any case, mandated by law and is the work of the Election Commission,” said TMN Deepak, State president, December 3 movement. In November last year, Deepak wrote to TR Baalu, principal secretary of the DMK, with a list of 21 demands, of which six have been listed in the party’s manifesto. “We welcome the inclusion of demands such as an additional 0.5% interest per annum for deposits by persons with disabilities in public sector banks and also eliminating taxes for assistive devices and their spare parts. But I was looking for promises of better representation for PwDs, especially in the local bodies,” he said. Ahead of the elections, a group of around 40 women’s organisations including National Federation for Indian Women (NFIW) and All India Democratic Women’s Association (AIDWA) prepared a list of 74 demands. Included in this set of demands was a separate legislation for honour killing, increased allocation for National and State commissions for women and for the Indian Government to fulfil its obligations under the Convention for the Elimination of all forms of Discrimination Against Women (CREDAW). The forum also stated that although the gender component plan mandates a 30% of the budget allocation for pro-women schemes, it has not been implemented. The forum, therefore, demanded not only for the implementation of the component plan but for an increased 50% allocation for pro-women schemes, in line with the population of women in the country. “The 33% reservation bill for women in the Lok Sabha and legislative assemblies have been addressed by both the parties (DMK and AIADMK). The DMK has also put forth the promise of appointing 50 lakh rural women as people’s welfare workers – that is to be welcomed but important points such as exploitation of women in unorganised sectors, have been overlooked,” said G Manjula, one of the coordinators of the All Women’s federation. 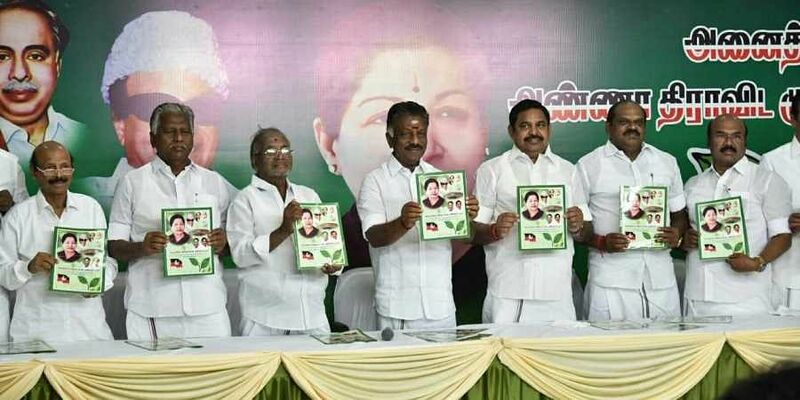 In addition, while the DMK had promised 30% reservation in Central Government jobs for women, CCTV surveillance at establishments employing women – the AIADMK said that it would urge the Centre to undertake and implement The Girl Child Protection scheme and The Cradle Baby Scheme of Tamil Nadu at the National level and in all States. As for transgenders, the DMK promised to bring a comprehensive legislation in line with Private Member Bill moved by the DMK in the Rajya Sabha. “This bill, apart from a few minor corrections, could be the solution to many of our problems,” said Grace Banu, a transgender rights activist. Both parties have also failed to address housing concerns for those in informal settlements.